Philip Gold's tribute to his older brother Alvin. Stan points out the importance of human hearing in the hi-fi system. Jon Thompson uncovers sound quality differences in HDMI cables. 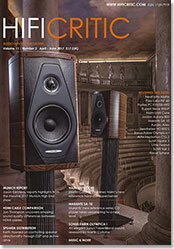 Jon Vizor describes an extraordinary hi-fi retail experience. Chris Frankland tries out an ultra-compact floorstander. 16 Who's Minding The Store? Andrew Everard checks out the means of storing music files. Kevin Fiske tackles a solid state integrated amplifier. Chris Bryant tries out a very useful computer-to-headphone amplifier. Keith Howard on controlling speaker directionality through DSP and active drive. 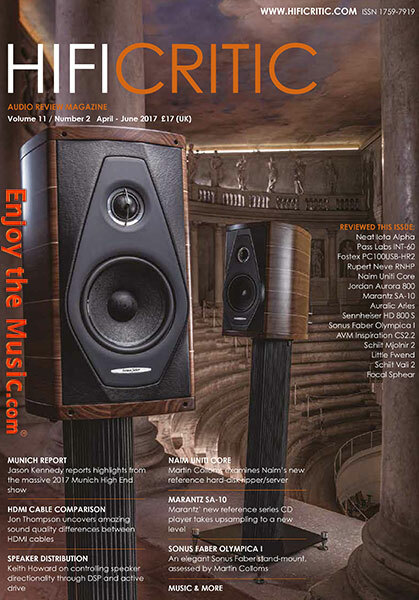 Julian Musgrave suggests reviving the livevs-recorded approach to evaluating hi-fi equipment. Martin Colloms assesses a headphone amplifier from a famous Pro-Audio name. Martin Colloms examines Naim's new reference hard-disk ripper/server. Andrew Collett reckons he has significantly improved his Jordan Aurora 800s. Marantz' new reference series CD player takes upsampling to a new level. The stream-literate Rafael Todes tackles AURALiC's impressive Aries. Martin Colloms gets to grips with an upmarket moving-coil headphone. An elegant Sonus Faber stand-mount, assessed by Martin Colloms. Andrew Everard reviews the entry-level Inspiration CS2.2 system from German newcomer AVM. Martin Colloms tries out two valve-based headphone amplifiers. Andrew Everard gets us up to date with the complex world of music streaming. Gordon Taylor explains how car audio has evolved since our 2011 article. Short reports on this 'n' that. Adam Fairless of Ziro Audio picks ten albums. Greg Drygala's half dozen discs. Paul Messenger and the cast iron upgrades.